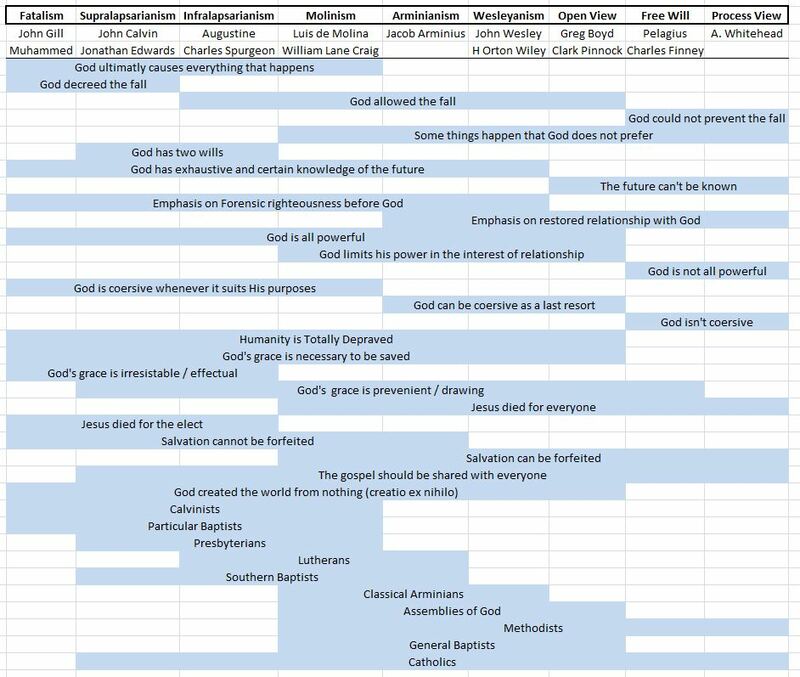 Here’s a chart I made that shows some of the differences and commonalities of various theological viewpoints as they relate to Calvinism and Arminianism. It’s not perfect, and is only intended to give a general idea of what the theologies emphasize as important. If the image is difficult to read, you can click on it to enlarge. Comments and criticisms are welcome. Interesting chart showing the theological viewpoints of various movements. So, is this chart your own creation? Yes. I’ll update the post to make that more clear. Kevin – This took a lot of work and seems fair to me. I would interested if people from each group thinks they are represented fairly. Excellent!! Great chart! Could you expand on the ex nihilo part not including Free Will/Process View. I havn’t heard that before. Hi Steelwheels, The process view argues that the universe has always existed, but in a chaotic state. Rather than creating from nothing, process theologians argue God has instead brought order to chaos. The argument goes somthing like this: God is good. But evil exists in the world. If God created the cosmos ex nihilo, it would be perfect, and there would not be any evil. Since evil exists, that must mean that God did not have the unilateral power to prevent evil, so it follows that He did not create the universe from nothing. Process theologians also argue that ex nihilo is a Greek concept, and that the Bible instead describes God creating order from chaos rather than from nothing. I don’t hold to process theology myself, but I do want to represent it fairly. One theologian who argues for the view described above is Thomas Oord. See his thoughts here. Oops, left of Arminianism? W always seemed a to lean a little more toward the reformed camp than most think. I passed your chart along to an orthodox friend who wondered where they would fit on the chart. Hi Steelwheels, Wesleyans encompass a pretty broad range of views. Some would be to the left of Arminianism (like Craig), and some to the right (like Oord). But overall, I’d say they’re more to the right. It’s hard to put Orthodox into a box, but I’d maybe have them from the Infralapsarian to free will range. They are less sympathetic to the views of Westerners like Augustine, and would affirm creation from nothing. I wonder if you’d almost have to have a completely different chart for Orthodoxy? As I understand it (and I could be wrong) they would reject the Western concept of Total Depravity, due to their different understanding of sin (since they, I believe, do not view it as something that we inherit as part of our nature). I think they’d also reject ultimate divine causality, the idea that God has two wills, and perhaps the idea of God being able to be coersive as a last resort. At the same I think they would emphasize restored relationship with God and possibly reject completely the idea of forensic righteousness (or at the very least place very little emphasis on it). In terms of this chart, Orthodoxy seems (from my limited reading) to have very little in common with everything to the left of Arminianism, and not much in common with many things to the right of Wesleyanism — while at the same time having some pretty different understandings of things than anybody in Western theology. Anyway… loved the chart. It’s a helpful (and, I think, fair — spoken as a Wesleyan-Arminian-turned-almost-Calvinist-turned-Wesleyan-Arminian) visual breakdown of the different theological stances. Good thoughts, you’re right that Orthodoxy is a bit unique and doesn’t fit into the chart real well. Kevin – Your chart speaks of “God can be coercive as a last resort” for Arminians. I see coercion as Prevenient Grace, God is coercive in that He has made things/events to point to Him so as we go thru life, we see God at work (this is for non-christians too, to bring them to Him). Nevertheless, He still provides opportunity to reject Him. I see it as a kind of leverage that God uses to bring us to Him. Coercion has the intent of “making” the person do what He does not want to do but it is not overpowering. For example, torture is a form of coercion but the person ultimately has a choice to let the interrogator know what the interrogator is asking or can refuse to comply. Hi Dale, thanks for the good thoughts. I’m defining coercion closer to the way your Calvinist friends do. I understand it as God working unilaterally in individuals in such a way that they MUST do exactly what God decides. They have no other options. They become completely devoid of any degree of self-determination. I don’t know if that’s the best or most accurate definition of coercion, but that’s what I had in mind. Wooing, persuasiveness, and heavy handedness are different than coercion. In all those cases, a person still has options before them, even if the options are unappealing. Typically, I think God prefers to woo us. He pursues us like the way the lover pursues his love in the Song of songs. God is always active in our lives. He doesn’t work in a “hit and run” sort of way. When necessary, for our own good, God can work in more heavy handed ways (like Saul on the Damascus road). But even in those cases we have options, and God is doing what he knows is best for us. If my understanding is correct, Molinism attributes an absolute and a conditional intention to God (which I think can be called His two “wills”). At least that’s how I learned it from Craig himself. Is it ok if I repost this? Hi Jason, sure, that’s fine. Hi Kevin, I saw this at the time but didn’t get around to writing anything. My thoughts. I think you need to separate out ideas, systems, and people. Perhaps use a different colour for each? For the people keep the rows in rough chronology. Perhaps in 500 year lots? So Boyd would be in the same row as Craig rather than Augustine. Part of that just seems more aesthetic, but ideas develop so some later theologians may grasp ideas that earlier ones may not have been aware were distinct say. I would add that Mohammed seems out of place as the others address the Christian faith, even if unorthodox. Perhaps give other religious leaders their own row? Then have the systems and churches in another colour, ie. from Calvinists to Catholics. Then have individual beliefs. I wonder if related beliefs should all be on the same row? Not certain how best to do this. Different colours, or perhaps if you graduate the colour from light to dark in the row, then the change would be visible when it is abruptly light again. So decree, allow, not prevent Fall would all be on one line but the disagreement between the groups would be clear. *Would it be better to say God cannot know the future exhaustively, but can bring about a future he desires? It seems as it stands the future could be anything for open theists. *Total deprivation, do all who hold to this agree on what they mean by this? *Forfeit salvation same line, but diagonal where both beliefs are held. Bethyada. . . did you ever make some of these changes? I would be interested in seeing what you mean, even if it was just done by hand and scanned in. Bethyada, good thoughts, I don’t disagree with any of your ideas. It’s more of a limitation of the chart then anything else. It would be helpful to have a 3D or even a 4D chart if possible. Time from (as you mentioned) would be nice to have in there. And it’s not really fair to pigeon hole the different systems. For example, Molinism has different answers for some of the questions, and it isn’t really fair to say that Molinists believe God is coercive – at least not in the actuality that we have. I also struggled with process theology – it perhaps could have gone to the left of the “free will” view. They definitely limit God’s power, and even reject creation from nothing, but at the same time they do hold to prevenient grace of sorts. Lot of work went into this chart Kevin, good work. There almost needs to be a side column explaining which category the spectrum in looking at. For example, one side category could be “God and Time” and then go from “God causes everything” to “the future cannot be known” and so on. * I didn’t know that Pelagianism taught that 1) the future is open and 2) God is not omnipotent. Are you sure of this? * I don’t think Open Theists would consider their view to be fairly depicted with “The future can’t be known.” For Open Theists, the future can be known in so far as God has determined to cause it to happen, like in Calvinism (which kind of messes with the spectrum chart). Open Theists would say the future can’t be know *in the same way* as the past and present are known. But much of it can be known in so far as God has determined it to happen. Using my will I changed how I’d reply here. Can you show me an example of God being coercive? Some Arminians think God can be coercive (especially in the positive direction), however, I’m not convinced that he ever is. At least not in the absolute sense. It’s an area of disagreement among Arminians. See I was going to say that the chart could be quiet useful – if it is accurate. A couple of areas that possibly need to be revised. The title above Pelagius is titled Free Will. I think Pelagius believed that salvation could be achieved by human effort alone without need for God’s help. Actually most of the Early Fathers believed in Free Will. For just one example look at Irenaeus (Against Heresies, book 4, chapter 37, paragraphs 1 – 7), disciple of Polycarp, who was a disciple of John, the Apostle. Augustine introduced a fairly novel idea in Christian theology. Election became selection with no reference to individual human wills. God could have predestined others, but for unknown reasons did not. Augustine changed his earlier view regarding the synergism of human will and God’s grace to one of divine monergism in salvation. Charles Finney believed in God’s total foreknowledge and God’s omnipotence. Here are two of Finney’s sermons one on Election and the other on Election and Reprobation to reconsider your chart. http://www.gospeltruth.net/1836SOIS/10sois_election.htm and http://www.gospeltruth.net/1852OE/521124_election_reprob.htm . These sermons certainly don’t place Finney under Pelagius. Thanks for the thoughts John. I don’t disagree with any of your points. The chart has its limitations.